of Excellence by TripAdvisor. 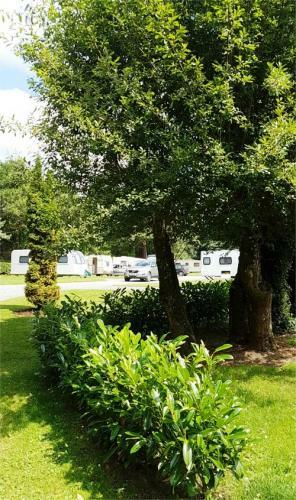 Situated right in the heart of one of the most picturesque valleys in Ireland, the Park offers a quiet and relaxing holiday in a country environment. The secluded and beautiful Glen of Aherlow lies between the dramatic Galtee Mountains, Ireland’s highest inland mountain range, and the wooded slopes of Slievenamuck on the edge of the Golden Vale. Woodland walks are readily accessible from the Park which is also a superb area for birdwatching. Feeling adventurous – explore the Galtees and their five corrie lakes or go off-road cycling at the award winning Ballyhoura Mountain Bike Park. Tourist Office and Coach Road Inn: 300m. Also within walking distance: Aherlow House Hotel, Restaurants, Nature Park and National Loop Walks. Excellent base for touring Southern Ireland. Modern Sanitation Facilities, Laundry, Campers’ Kitchen, Recreation Room, TV Room, Free Wi-Fi throughout the Park. Easy access to facilities with fully equipped wheelchair accessible separate suite. Large and level pitches, hard-standing and grass, each with electricity and water. The Park is secured by electronic barrier. Groups and Rallies welcome. Holiday Homes also available. Chosen as: The Caravan and Motorhome Club Affiliated Site, ANWB Special Selected Site. Recommended by: All Leading Guides, our Customers and TripAdvisor.